3D Construction Kit 2 (3DCK2) is a great sequel to Incentive/Domark’s 3D Construction Kit, released a year earlier. As with the first title, 3DCK2 isn’t really a game but a powerful application that lets you create 3D action/adventure games. The engine is powered by Freescape, Incentive’s acclaimed game engine that anyone who has played ‘80s classics Castle Master or Driller, or any other Incentive game is familiar with. 3DCK2 allows you to create a 3D world by building objects, then positioning them accordingly. For example, a house can be made up of a cube with a pyramid-shaped roof. Add a door and windows, and you’ve got your own virtual bungalow. You can also inspect your work from any angle, at any time, by simply walking or flying around the area it's in. With enough time and patience, you can actually design an entire town, complete with the insides of every building. But a 3D game isn’t a game if it’s just a pastiche of different virtual environments, and here is what makes 3DCK2 much more superior than simple 3D applications. As in the first Kit, 3DCK2 lets you write the entire game using a special language which can be accessed on the Conditions menu. The language is similar to BASIC, but customized to 3D games. You can control things, enter doors, pick up objects, display messages, and write complicated routines and characteristics for each object to your heart’s content. When you are done, you can then save your game with the compiler provided. This allows the game to function separately from the program so you can give copies to your friends. And it'll be just like a real Freescape game, with a plot, goals and missions, whatever you want. Overall, 3DCK2 improves upon the first release with many more options, a much more user-friendly interface, and most importantly, sharp 256-color VGA graphics. 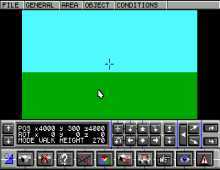 If you ever want to create your own 3D game, you’d be amazed at what this small 1992 application can do. Two thumbs up, way up!